One perennial problem we face in monitoring is dealing with noise. We don't want to miss important signals, but sorting through all the noise can be a chore. Ideally, we want to spend as little time as possible doing the setup work needed to achieve excellent signal-to-noise ratio. The feature we've just released will help you get closer to that optimal setup faster, with less work. Automatic default grouping of all occurrences of an error, so if an error occurs 100 times, you'll see only one error item in your real-time error & crash reporting feed. Custom grouping rules you can set. For example, you can set a custom rule so that all future occurrences of an exception class are grouped as one error, regardless of the stack trace. You can also manually merge errors directly in the feed. When you do a manual merge all past occurrences get grouped, not just future ones. 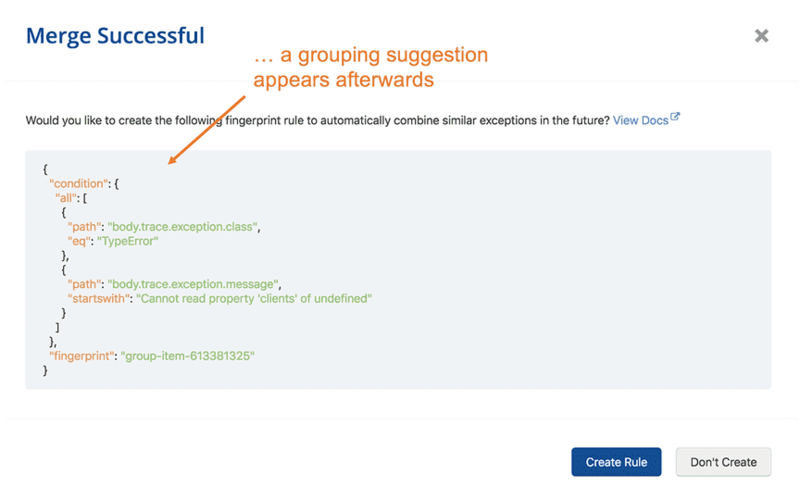 With Grouping Suggestions, Rollbar will now attempt to suggest a custom fingerprint rule whenever you manually merge errors. When you accept a suggestion a new custom fingerprint rule is created and you won't have to manually merge similar errors again in the future. The first release of this feature detects items with the same exception class and similar exception messages, and automatically generates the JSON fingerprinting rule for detecting future occurrences. With this feature, if you don't have time right now to do grouping setup work, you can start with default grouping rules, manually merge errors opportunistically while in Rollbar, and accept each grouping suggestion you receive. Do this and you'll be reducing noise as you go. 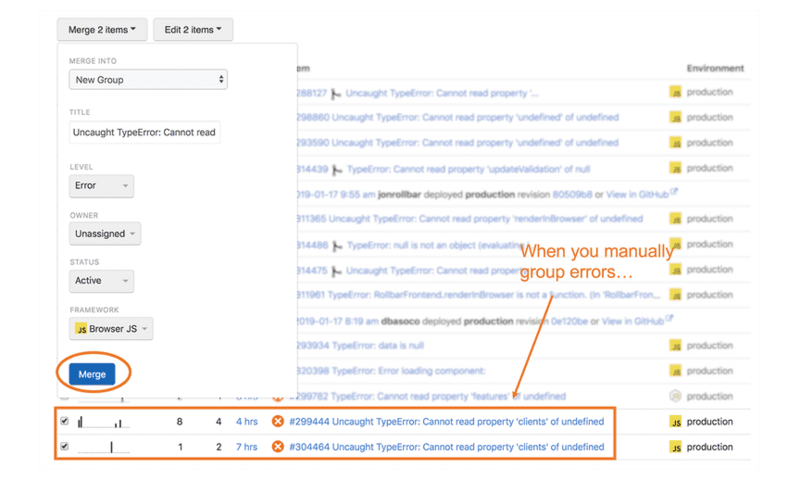 If you're new to Rollbar, also check out these tips on error grouping. We're going to keep improving this feature and noise reduction features like it, so if you have any feedback, we'd really love to hear it! If you aren't using a tool like Rollbar yet, you're practically outsourcing bug discovery to users. Rollbar provides realtime error monitoring to help you release better software faster. Instantly see all errors as they occur, and debug them before users notice. Give it a try for free!